I was able to choose anything I wanted to do in our master suite bathroom, and I scoured Pinterest for months trying to figure out what I wanted. I am addicted to pink. Pink and I are soul mates. Long lost sisters. Fused at the hip. But . . . I wanted something a little more elegant and luxurious. I wanted something that wouldn’t make my husband throw up in his mouth a little. I kept pink to a minimum. 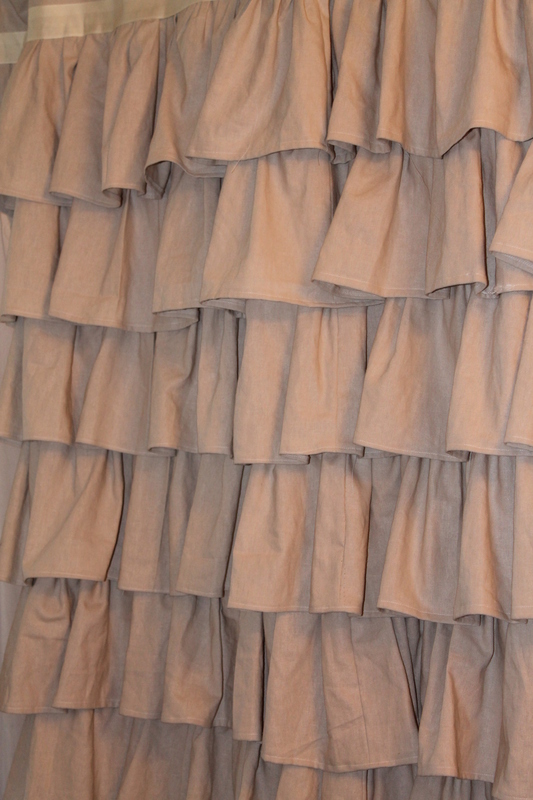 I found some look alike linen fabric at JoAnn’s for 9.99 a yard, and with a 50% coupon, I got 10 yards for under 50.00. The shower curtain took more than 9 yards, so it was a good measurement on my part, especially for eyeballing the curtain. Because that’s how I roll! The shower curtain is really heavy. Really, really heavy. So I knew a standard rod wouldn’t be sturdy enough. Besides, the sides of the tub inset don’t go all the way to the ceiling. This was never meant to be a shower. However, it was meant to be a real cool super-jiving 1970’s avocado bathtub, and I thought it would be nice to cover it up. Because I wanted a lighter, airier look for the window treatments, these side panels fit perfectly to marry the linen and cotton together. 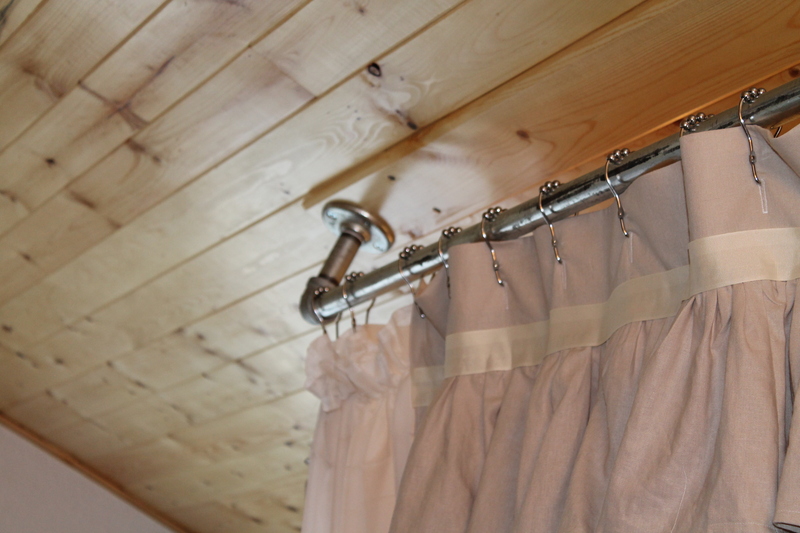 It also protects the shower curtain since I am not pulling on it to open and close the curtain. The panels are completely washable, but I’m trying to wash the curtain only in spring and fall cleaning sprees and only by hand to avoid shrinking. 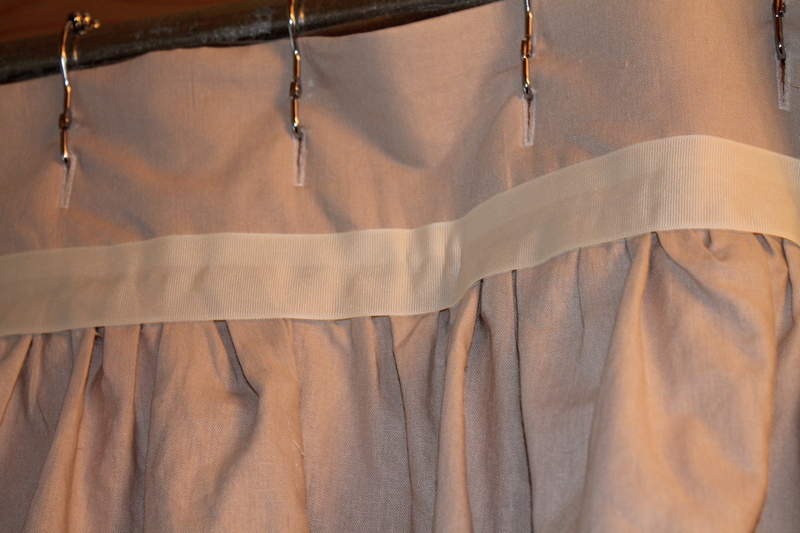 I needed to do something to shore up the top of the panel since I was going to use button hole stitching for the hangers, so I added some interfacing and a ribbon to cover the seam. That made the top sturdy enough to hang the hooks on without tearing. 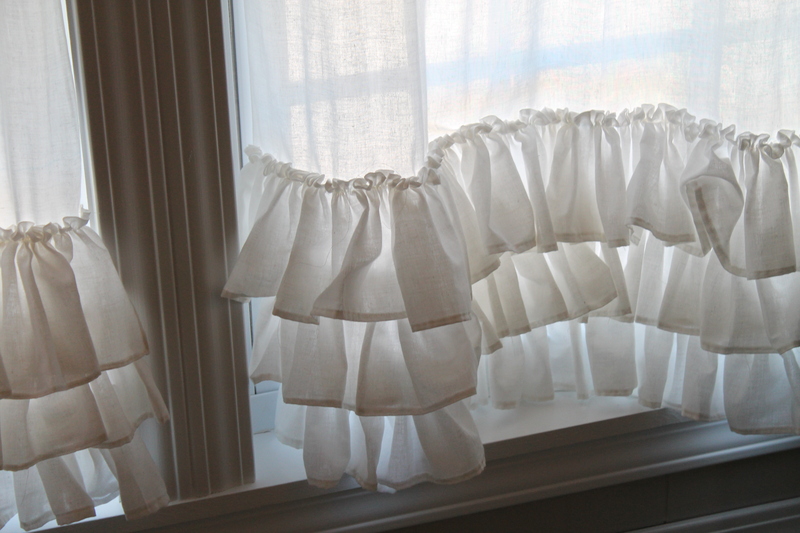 The window curtains were made from a simple cotton that I bought at Walmart for 1.97 a yard. 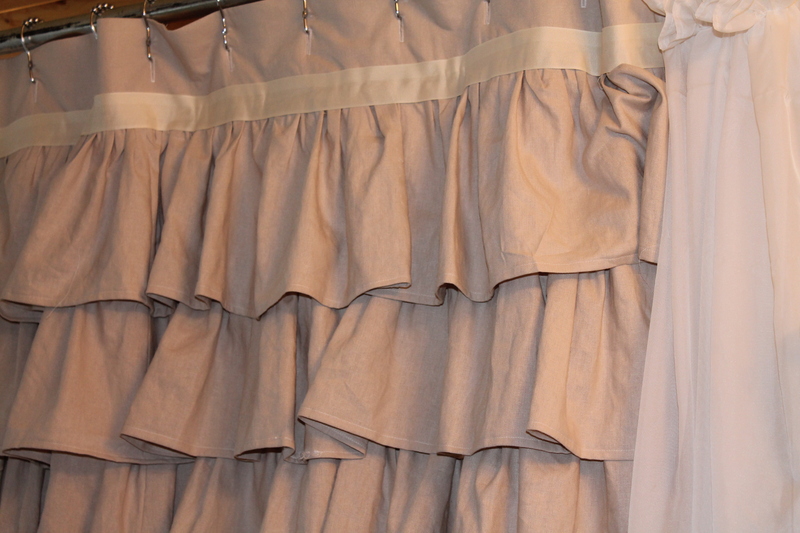 The ruffles are different than on the shower curtain, but I hemmed top and bottom to try to avoid fraying. 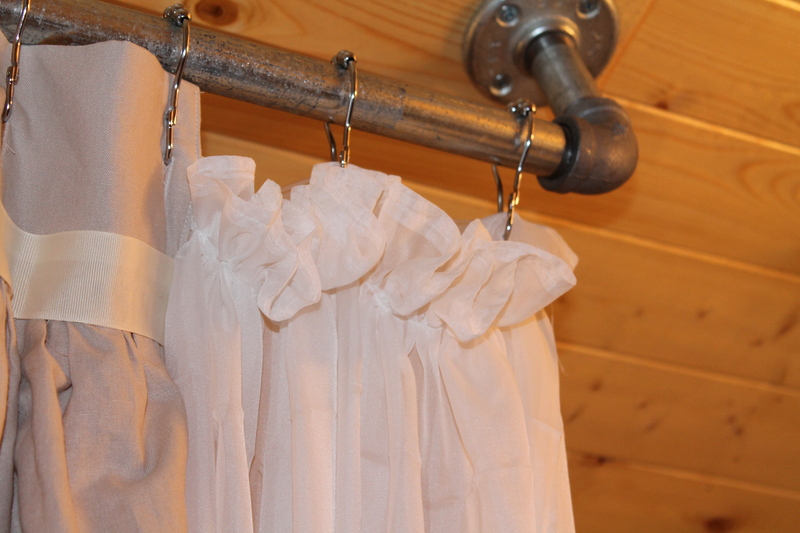 I am a novice sewer, so I had to work hard to get them ruffled just right and pinned straight. 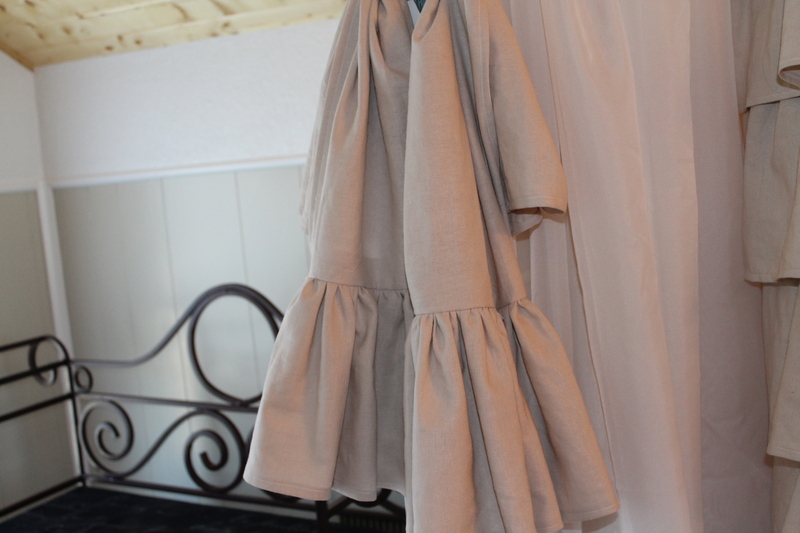 I have a ruffler foot, but I did all of the ruffles for the bathroom the old fashioned way. It’s the best way for me to get them even. 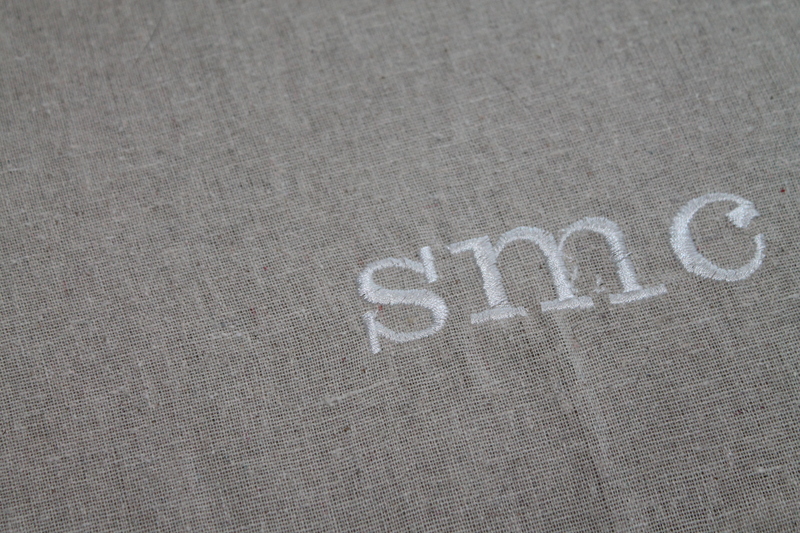 I saw some linen hand towels that I fell in love with, so I made a couple for the bathroom. 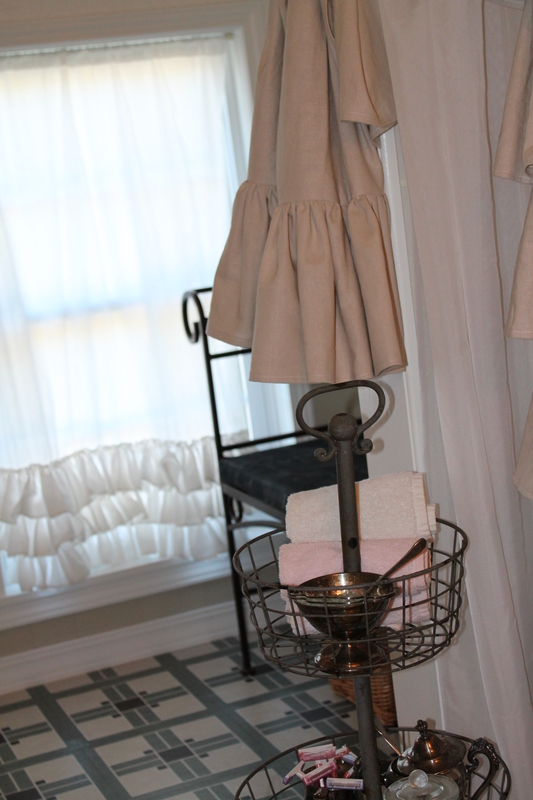 Since we use the sink frequently and are chronic handwashers, the linen isn’t very practical, but I love how they turned out, so I put them on a hook. 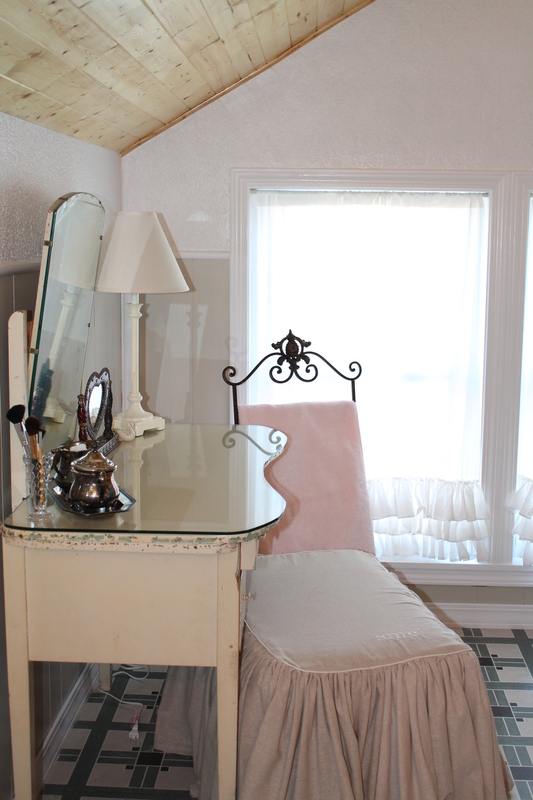 Finally, I had an ottoman that I was no longer using and fit perfectly under my chippy little vanity. 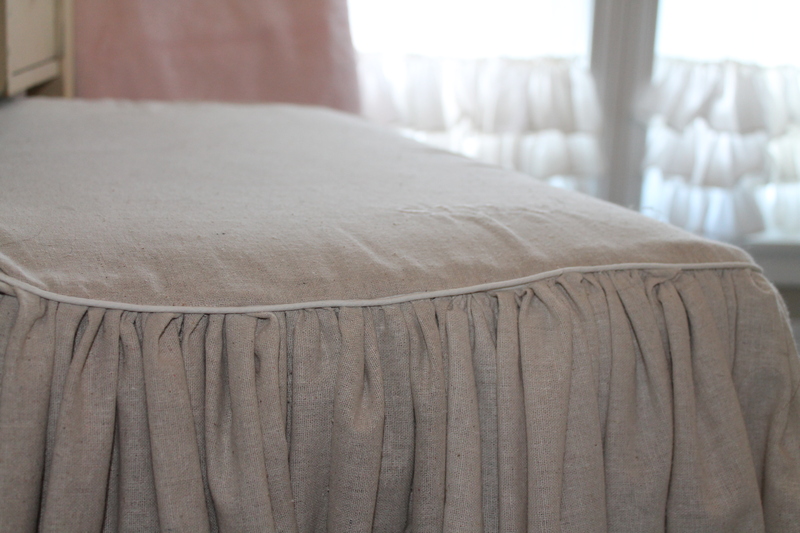 I made a slipcover for it out of the same look-alike linen and monogrammed the corner of it. I think it is about four or five yards of fabric because I gathered it as tightly as I could. 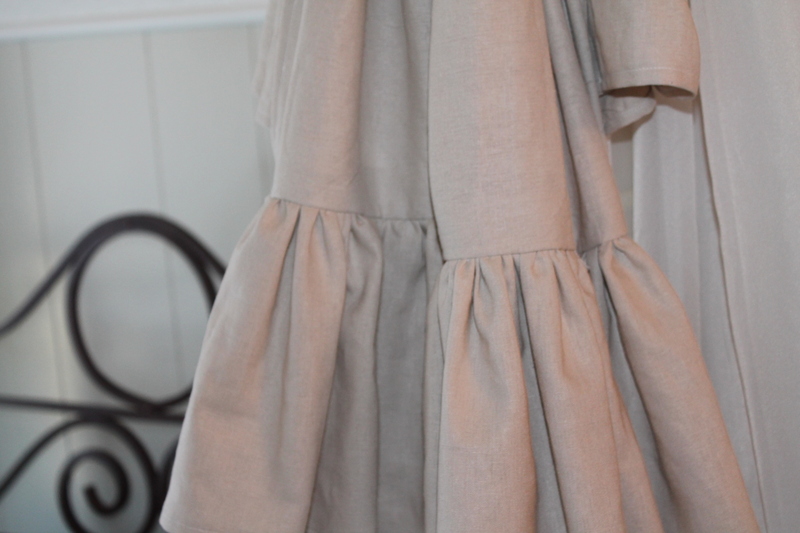 I made this skirt twice because it just wouldn’t lay right. The second time, I added piping. If you have never sewn piping, it is difficult to work with and is as intimidating as putting in a zipper. In many places, it isn’t perfect, but it is, as The Fly Lady says, good enough. We have a garden bench in a nook in the corner. The vent is on the corner wall, so we need to make sure it doesn’t get covered up. I love the bench, but it needed something. I made a cushion with fabric from JoAnn’s that I adore. I think it was about 40.00 a yard, but I got it half off then used my teacher discount to get another 15% off. 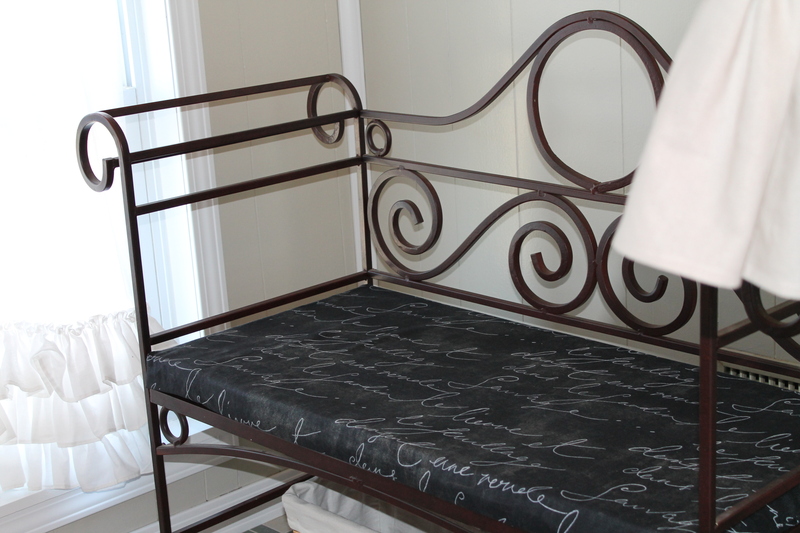 The cushion took about a yard, and I had purchased the fabric for my craft room closet, so I had just enough left. In fact, I think I have enough to make a couple of pillows. 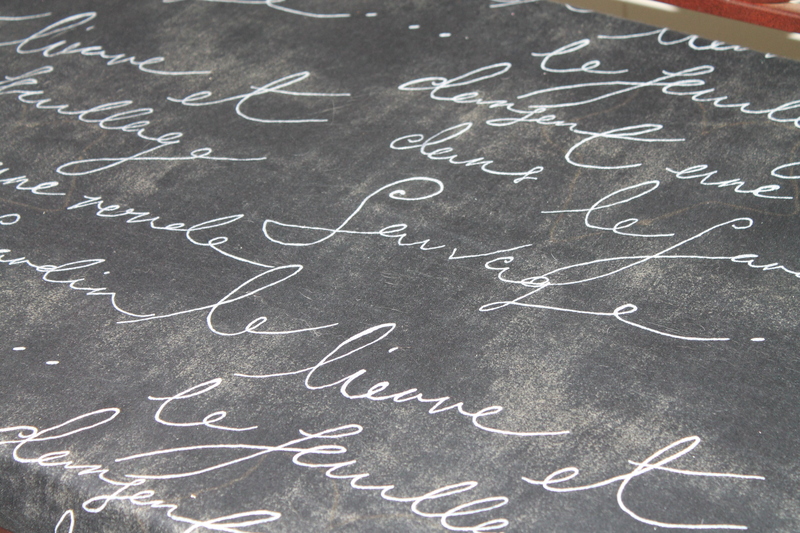 Even though the bath mat is not a fabric, I think it adds some texture and interest to the room. We did not change out the tile, but I plan to put down a penny floor next summer, so I’m just working with the tile we have. 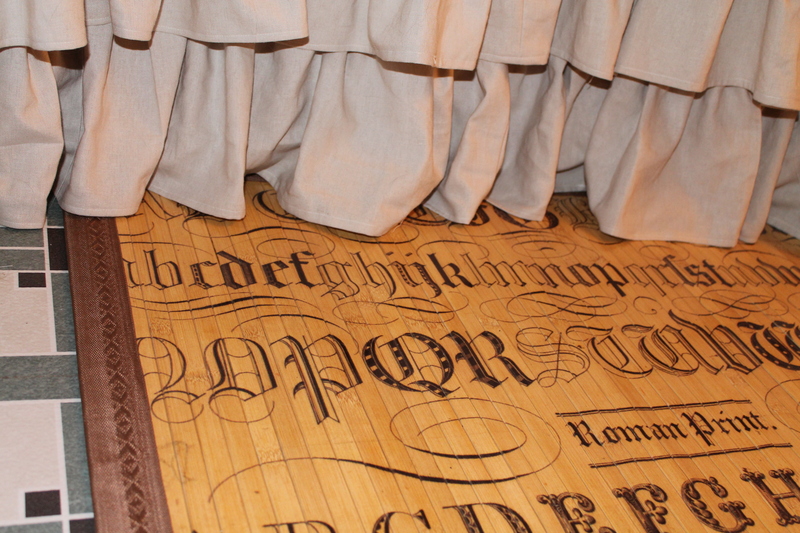 It’s not horrible by any means, but I do need a mat by the tub, and I had this one in my craft room where it didn’t work nearly as well as it does here. I’ll have one more post to discuss the accessories I used, but I hope you’ve enjoyed this post! Feel free to share, pin, or whatever else you want to do, but please, please link back to my site if you do! This entry was posted in Bathroom, home, Master Suite, organization, Uncategorized and tagged Bathroom, Elbow, Jo-Ann Stores, Linen, Look-alike, Pinterest, Shower, Walmart by Shannon. Bookmark the permalink.